For a brief moment during today’s women’s team finals at the 2018 world gymnastics championships in Doha, it seemed like a country outside of the traditional three—the U.S., Russia, and China—would grab a team medal. These were the standings at the end of the third rotation, with one to go. While the U.S. and Russia were pretty firmly holding down one and two—especially the Americans—the bronze seemed up for grabs. Brazil was in third. They were barely shown in the livestream so I can only assume this was due to the fact that they were hitting well. They were closely followed by France, Germany, and Japan. Perennial favorite China was all the way down in seventh. Just over two points—two falls—separated third from seventh. And even Canada, despite sitting in last place in the team final, still had a very slim chance. But Brazil lost their shot at the bronze with major mistakes on bars. France’s superstar, Melanie de Jesus dos Santos, fell off beam. In the end, Canada moved up from eighth to fourth, their highest world team finish in history and China surged from seventh to third to claim the bronze. Meanwhile, the U.S. just needed three reasonably hit floor routine—not even particularly good ones—to win their fourth straight world team title, their sixth overall. 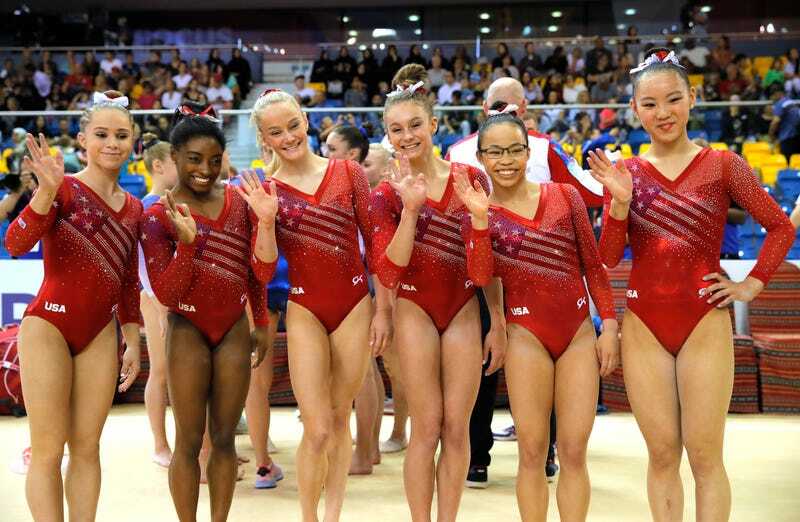 It didn’t matter than Morgan Hurd went out of bounds or that Simone Biles sailed out on her opening pass. Nothing short of one of their gymnasts stopping a third of the way through her routine and not completing it could stop them from winning. It’s been said a lot but it can’t really be stressed enough but the U.S. women’s performance at these worlds has been nothing short of remarkable, especially given the institutional disaster that has been unfolding around them. The gymnasts have been remarkable composed amid all of the chaos, hitting complex routines while the adults around them fumble on far easier tasks, like not going through a potential CEO’s social media feed before announcing the hire. An advanced search on Twitter is not more difficult than doing a full twisting somersault on the beam. The gymnasts get the job done while the administration makes excuses. On the NBC broadcast and online, there has been a lot of discussion of the new kinder, gentler USA Gymnastics. The proof that commentators Tim Daggett and Nastia Liukin offered to support this point: the inclusion of 17-year-old Riley McCusker in the team finals beam lineup. During preliminaries, McCusker, who is absolutely gorgeous on beam, fell off during her layout series. During the reign of Martha Karolyi, a mistake like that in prelims would’ve resulted in you not making the lineup in finals. But when USA Gymnastics submitted their team lineups yesterday, McCusker’s name was listed for beam despite the fact that the team is lousy with excellent beamers. On Facebook, Tom Forster, the women’s high performance team coordinator—they’ve ditched the “national team coordinator” title that Karolyi held—explained the team final lineup decisions, especially since it had been the subject of some discussion online. Forster noted that the reason 2017 world all-around champion Hurd was up first on floor—typically, higher scorers are put later in the lineup—was because she wanted to be. And as for why McCusker was in the beam lineup instead of Hurd, who scored better than McCusker on the first day and is the defending world silver medalist on beam, Forster explained that McCusker has a higher potential score and that he wanted to give world championships rookies like McCusker every chance to gain experience. This is smart long-term strategy. When it comes to selecting the team in 2020, he’ll want as many gymnasts with as much experience as possible to choose from. McCusker more than redeemed herself today, hitting a beautiful set on beam and also on bars. The feed didn’t show either performance so I’m going to drop the video here. While it was nice to have an explanation of why the lineups were the way were and it was wonderful to learn that the gymnasts were allowed input into the order in which they competed, it’s important to point out that the U.S. was in a can’t-lose situation. Forster was playing with house money. Any lineup he put up would’ve won. It’ll be interesting to see what happens when, at some point down the line, the U.S. isn’t guaranteed a gold medal. In that situation, will he give the spot to a gymnast who made a mistake but has a lot of potential or will he play it safe? With Biles on the team, this is not a question that Forster and Co. will have to answer for a while. While the U.S. women would’ve been heavy gold medal favorites even without Biles, her being on the team gives them a lot of breathing room in the points department. On just vault, she usually scores about a point higher than anyone else in the field. Biles, who is still dealing with the kidney stone that sent her to the ER a couple of days ago, wasn’t as sharp as she had been in qualifications. After top scores on vault and bars, she was off on beam, forced to grab apparatus on a wayward piked front. And on floor, she couldn’t control her power and flew out of bounds. Not that any of this matters for Thursday’s all around final. If she repeated the same mistakes, she’d still pick up her fourth all-around title. Biles is truly unstoppable. And the U.S. team with Biles on it really can’t lose. Even if she’s having a bad day.